The CS-SMA adaptor is used to connect fiber patch cords terminated with an SMA 905 connector within a standard CS mount. The CS-SMAR adaptor is used to connect a spectrometer directly to an SMA 905 receptacle without the use of fiber patch cords. If you have a C mount instead of a CS mount on your imaging device, the C mount lens will require a 5mm ring to be fitted between the camera and lens to achieve a focused image. 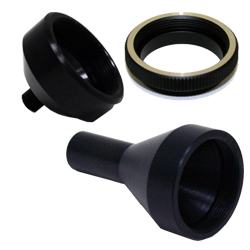 For this, we also provide the C-CS adaptor.